I just watched your video on scraping binding. I understand that there are two ways to deal with binding and the color coats. First, you can spray the color on the binding and then scrape it off, or second, completely tape off the binding. Is this right? What about the clear? Do you do the same or do you completely cover the binding with clear and not scrape it off? Thanks. As far as I'm concerned, you should always tape off binding. The issue that you can run into is that the top of the binding (that you see when looking at the face of the guitar) can be challenging to mask off because it’s such a small strip. The general idea is to mask the binding off, shoot your color, then scrape the binding on the face of the guitar. Binding is not scraped after clear coats; it should be covered just like the color. Adding binding to a LP Studio...? When I did my LP Studio overhaul, I initially was going to bind it, but it really wasn’t worth the trouble. You’ll need a binding jig similar to what you can find on the stewmac site to cut your binding channel on the body, however, you’ll have to do the areas around the neck/body joint by hand with a chisel because you won’t be able to just rout the body without cutting into the neck once you get close enough to the junction. The other thing you have to take into consideration is that you’ll need to cut the rounded edge of the top of the body’s perimeter away completely before adding your binding. You might be able to get away with .060 binding, but the .090 would be more likely (or doing some kind of multi-ply). 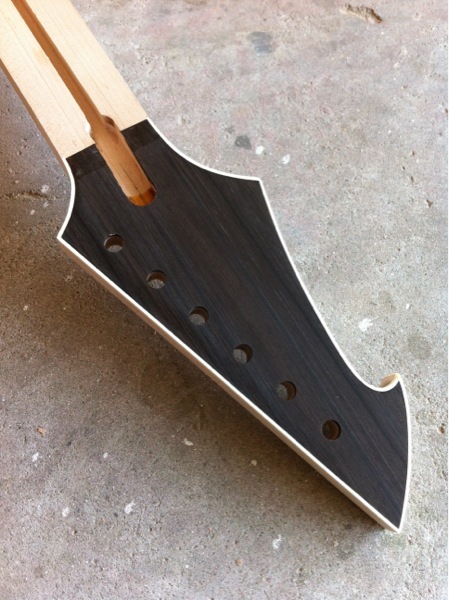 The neck is the other part; you’d need to pull the fret board, remove the frets, cut your binding channel, bind the board, then glue it back on to the neck, and then fret it. It’s pretty involved, for sure. I use the .060 thick binding for fret boards and bodies. Once you get all of that sorted, get ready to repaint it. Ebony headplate, binding scraped. Got a sweet slab of ebony for the fretboard. Stay tuned!